Ahh yes… It’s that time of year again. Finally! Jack Frost shows himself more and more as I look outside to see his unique designs, carefully placed throughout my windows. The boat seats are caked with frozen dew as I step into the boat for one of the last voyages of this open water season. The boat’s days are numbered for this year; it’s bittersweet. The seasonal clock is getting closer to what some of us eagerly wait for, through the spring thaw, the dog days of summer, and the crisp fall nights, ultimately to arrive back into the hard water season. The fist clenching, adrenaline pumping, “Ohh Baby” moments that Lake Poygan offers, is definitely something to get excited about… and I sure am. After watching my videos from last year, I just cannot wait to pop the first hole! Lake Poygan is a magnificent fishery. It is located within the Lake Winnebago System and plays a vital role in the system while holding its renowned reputation and respect. Poygan is situated in the northern portion of the Winnebago System and because of its make-up, allows for a quick freeze. When we think of first ice, we think of bays and channels. While this is true, it is something that makes Lake Poygan a phenomenal early ice contender because of how Mother Nature designed it. It is not a deep lake (for arguments sake we will say 10ft), but the entire west end doesn’t really have any external water access to speak of. An area to point out, however, is Lake Poygan’s springs which pop up in a few areas around its boundaries each year. That’s why it’s important to be prepared, especially on early ice. The first thing to prepare for on Lake Poygan, much less on any other ice covered water body, is safety. For early ice, the spud/chisel is your savior, your lifeline. This most simple piece of metal tells you where or where not to walk. I pound it twice, and hard, before taking the next step. The sweet hum of a solid hit is just something I love to hear. It means I am one step closer to my fishing grounds. As always, the life jacket is on but because of the chisel work, I haven’t needed it… yet. The fishing grounds on Lake Poygan can be literally anywhere. Last year showed this to be true to the fullest. I mean in all reality, fish were being caught on all ends of Lake Poygan, all season long! I have only ever accessed Lake Poygan through Noffke’s Landing (noffkeslanding.com) which is off County Road B outside of Winneconne. It’s a great place to stop in and check the current bite/ice conditions before heading out. As the winter progresses, roads are plowed and bad ice areas are marked by their crew. Not only do I launch out of Noffke’s for the easy access, but it makes for a great focal point to the three main areas I will suggest that you target. The first, is the well-known “Horseshoe”. This is a deep water bed located practically in the middle of the lake. It’s called many names such as the “Shoe” or the “Hole” but easily shows itself when looking to the middle of the lake on a topographic map. It’s the area which holds the deeper portions of what Lake Poygan has to offer. Man, I sure had some fun in the Shoe last year, resulting in a couple great videos for you guys! The thing about the Shoe is that the Wolf River’s channel runs somewhat close to its basin on the far eastern corridor. This allows for a sanctuary for the fish to congregate while deciding whether or not to keep traveling through the Wolf River. It seemed that while I was fishing this area, the 8.8 FOW reading on my flasher was my golden goose when talking about an exact depth. The second area is called Indian Point or Old Indian Point. It is the main point in the middle of the lake, on the northern shore. This point offers a gradual slope into the basin portion of the lake, ultimately leading into the Shoe. This area last year was fantastic! The 6.6 FOW area catches my memory as I had one of the best days fishing last year, during a packer game, in this area. The schools of white bass and the bonus eyes were just insane! I am so glad I had the cameras rolling as it made for quite the enjoyable video. The third and final area to target is not of a specific location but rather a depth of water. 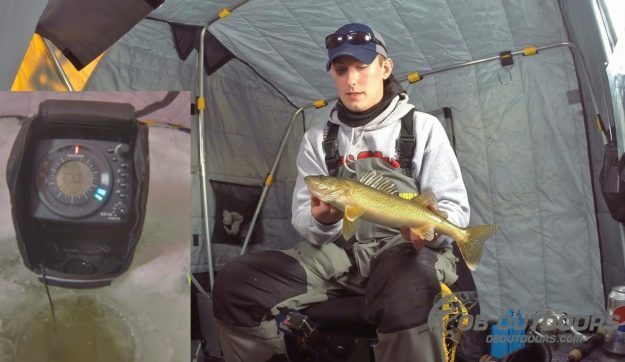 I am someone that full heartedly believes that the walleyes in the Winnebago System can be targeted year round in water depths of less than 5 FOW. Last year, my beliefs held true as I iced a couple magnificent fish in shallow water, including the one Poygan Pig pictured with this article. The trick of this shallow water lies within two asterisks. The first one is the normal one for any water, and that is finding fish – moving, moving, and moving. Sometimes I am making 100+ holes in a trip! Its hard work but the reward is definitely worth the effort. The second one is being quiet! When fishing in shallow water, a cough, a few words, even a pop can crack, can spook fish. There isn’t really a targeted spot for shallow water so to speak but I can tell you that when I had minimal snow cover during last year’s early ice, I was fishing on the biggest patches of snow I could find. It seemed that if I could find snow cover on water relating to any contour changes or “structure”, my odds were better to find active fish. This is because the water is darker and that’s what I feel is what the big girls wanted due to my success rates in these areas. When looking to equipment and tackle, I am running 6lb and 8lb test fluorocarbon on both of my Frabill Ice rod/reel combos. I carry both a medium and a medium heavy rod for different applications. Last year on Poygan, I seemed to use the medium heavy rod more as I was presenting bare, #5 Jigging Raps (mainly with the clown outfit) to most of the marks showing up on my flasher. The stiffer rod allows for a more controlled tap or bounce of the bait when worked in cadence. If you caught that, I said bare Jigging Raps. Last year was one of the years that the fish [usually] did not care for any meat on the lures I teased them with. Even when on search mode with Northland’s Buck-Shot spoons, I was still catching fish without meat. I think this is because of the diminished shad and other forage population numbers which hit the Winnebago System hard this past year. Because of this, more fish, including some dandy eyes, were being produced through the ice by many, myself included. Last year, after what I believe to be six years, I dusted off the tip-ups/downs and made them part of my arsenal again. This is saying something because Winnebago System success rates mainly rely upon the “running and gunning” style of fishing. 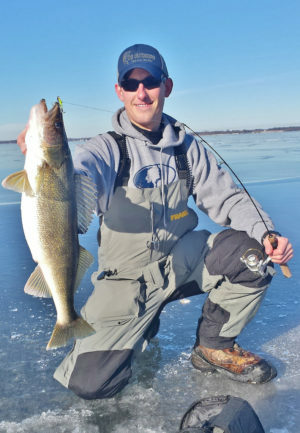 The running and gunning term pretty much means moving A LOT, not staying in one spot for more than 10-20 minutes, fishing with minimal equipment, and jigging – only jigging. Anytime I was granted the opportunity to step foot on the hard water before the sun began to show, tip-downs were out and large shiners where swimming. Some of the biggest fish caught last year were had (and hopefully released) through this method. A key point to note is that the tip-downs were placed in areas known to hold fish from prior fishing excursions utilizing the run and gun methods. This year seems to be heading in that same direction so be ready to bust them out! After another great year on the open water, I am certainly ready for hard water. As you are reading this, we are already in the hurry up and wait stage to be able to crack the chisel for the first time. If you haven’t fished Lake Poygan, I sure hope you put it on your radar this year! It’s an awesome area of the Winnebago System but it needs to be attacked with safety in mind. Last year was a tragic year on the Winnebago System and we need to make sure there isn’t a repeat. As I stated previously, Poygan contains springs so USE CAUTION, and sometimes a very slow pace to achieve success – safely! Even during the mid-season mark last year on Poygan, I was finding bad ice and had a very close call on my snowmobile. Be sure to follow the OB Outdoors Facebook page as I will keep a running tally of all of the bad ice areas’ GPS coordinates I find out about. If you find a spot yourself, please let me know and I will add it to the list for others to see. I truly hope you have a fantastic first ice and it rewards you dearly for your efforts! Until next time: ”Tight Lines. Stay Dry.